All-girl, pop rock group of girls, ages 10 to 16, debut their first original single “Krisi”. Pre-order your copy today. Too often, young people are influenced by the thoughts and life experiences of singers and musicians who are in their late teens and their 20’s. It’s time to give young people an alternative to these messages. Life for young people around the world can be filled with trouble and turmoil. Girl Pow-R is proud to announce the pre-sale of their debut single KRISI. This original, pop rock song KRISI tells the story of a school girl caught in a difficult phase of her life and the challenges she faces as she discovers herself and learns to use her experiences to better herself and others. KRISI is also about rising above the “mean girl” situations experienced by young people today. 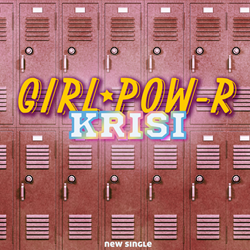 Girl Pow-R is the freshest all-girl, pop rock group of girls, ages 10 to 16, who are set to debut their first original single “Krisi” on November 24th. The single will be accompanied by a full-length music video shot entirely around the city of Toronto. This group of very talented young girls write music, sing, dance, and play instruments; they are truly an example of a modern, talented band. Girl Pow-R’s sound is rooted in pop rock, with the goal of inspiring others to be their best, through their music and lyrics. Since May, the group has performed over 55 shows, gaining fans of all ages! In the video clip, you can see their first live television interview on City TV as part of Youth Day 2017, which is 12 hours of non-stop music and arts. Additionally, their amazing vocals and energetic performances earned Girl Pow-R a 2017 Toronto Independent Music Award Nomination for KRISI. All great songs are created with a great team. The powerhouse voices from the girls in Girl Pow-R have contributed their vocal excellence to this debut original song KRISI. The creative team for this song is a.n.g.e.l from Arrival Music Group as the songwriter and Jovan Jovanov from the Music Artist Development Centre as the producer. Too often, young people are influenced by the thoughts and life experiences of singers and musicians who are in their late teens and their 20’s. It’s time to give young people an alternative to these messages. That is what Girl Pow-R has set out to do. KRISI has a strong message that the girls in Girl Pow-R are passionate about sharing. The struggles they have experienced personally, and seeing that life changes dramatically in school as we move from childhood into adulthood, has inspired the Girl Pow-R girls to launch this song to help other young people. The Girl Pow-R band was originally launched in conjunction with International Women’s Day in support of #BeBoldForChange to provide an opportunity for the voices of young women in the pre-teen to early teen years to speak to their peers in a fresh, new voice. The group has a unique mission to inspire young people and to support social causes with their music, positive messages, and age-appropriate lyrics. This passion has also inspired each and every member of Girl Pow-R to do more, and to actively participate in a social cause. The social causes that Girl Pow-R is passionate about are an extension of this song KRISI. The girls hope that their audiences will embrace the changes needed to help improve the world and inspire others, and make the world a better place through the messages delivered in the Girl Pow-R songs. In addition to a passion for music, each girl in the group also has a social cause that they represent like advocating for better education for girls all around the world, youth homelessness, or all of us taking better care of our health through the foods that we eat. You can learn more at the Girl Pow-R website: http://www.girl-pow-r.com or buy a 2017 tour t-shirt! LISTEN to this clip of KRISI here, and pre-order your copy today!